Minobusan overlooks two rivers, Fujikawa to the east and Hayakawa to the west and is covered with a lush variety of plants and trees. The magnificent cedars, designated as a natural monument and popularly knows as the “One Thousand Cedars” render its appearance more impressive still. The temple buildings, such as Somon (Outer Gate), Sanmon (Temple Gate), Main Hall, Founder’s Memorial Hall and Founder’s Ossuary, have been skillfully laid out so that they blend in the with the surrounding natural environment. Minobusan rises 1,148 meters (3,766 feet) above sea level. The Filial Piety Shrine was built at its summit to commemorate memories of his parents. 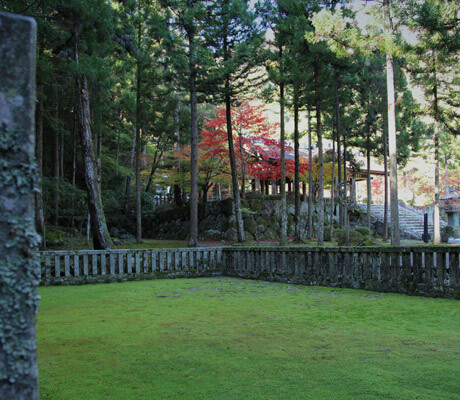 At the foot of Mount Takatori is the site of Nichiren Shonin’s original hermitage and his mausoleum to which an unending stream of visitors comes to honor his memory. To the west of Minobusan, Shichimensan rises 1,982 meters (6,502 feet) above sea level. The view from the summit of Shichimensan is quite spectacular as it faces Mount Fuji to the east. At dawn as the sun climbs over Mount Fuji, its rays stream through the gate of a temple dedicated to Shichimen Daimyojin (the protective deity of this sacred mountain) to shine upon the main temple. It is a sight of incomparable splendor.